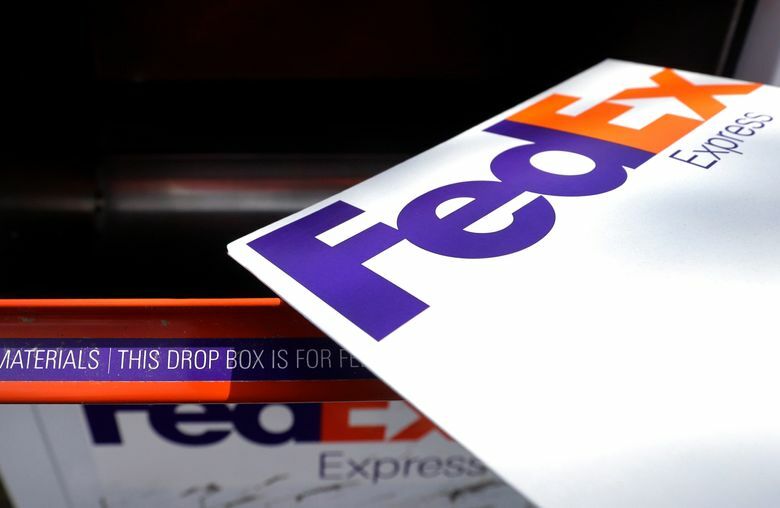 DALLAS (AP) — Benefits from the recent tax law drove quarterly profit sharply higher at FedEx, which also got a boost from strong performance in its ground-shipping business during the peak holiday gift-shipping season. The delivery company raised its forecast for earnings in the fiscal year that ends in May. FedEx Corp. said Tuesday that it earned $2.07 billion in the December-through-February quarter, up from $562 million a year earlier. However, the latest results included a benefit of $1.53 billion from the bill that cut corporate tax rates, mostly because it reduced FedEx’s liability for deferred taxes. Pretax income actually fell 3 percent. Adjusted to eliminate one-time benefits, the company’s earnings of $3.72 appeared to handily beat the forecast of $3.08 per share from 11 analysts surveyed by Zacks Investment Research. But Logan Purk, an analyst for Edward Jones, said that stripping out all tax benefits he calculated that the adjusted earnings were $2.67 per share. He said heavy package traffic and higher revenue per parcel were offset by higher expenses in the core Express business. “We view this quarter as a bit of a disappointment due to weakness in the Express business,” Purk said. He added that he is still optimistic about the company’s potential earnings power once it completes the integration of the European delivery business TNT Express. On a company conference call, Chairman and CEO Fred Smith highlighted broad global economic growth along with tax cuts. “We expect U.S. tax reform to continue to increase economic growth and investment,” Smith said. 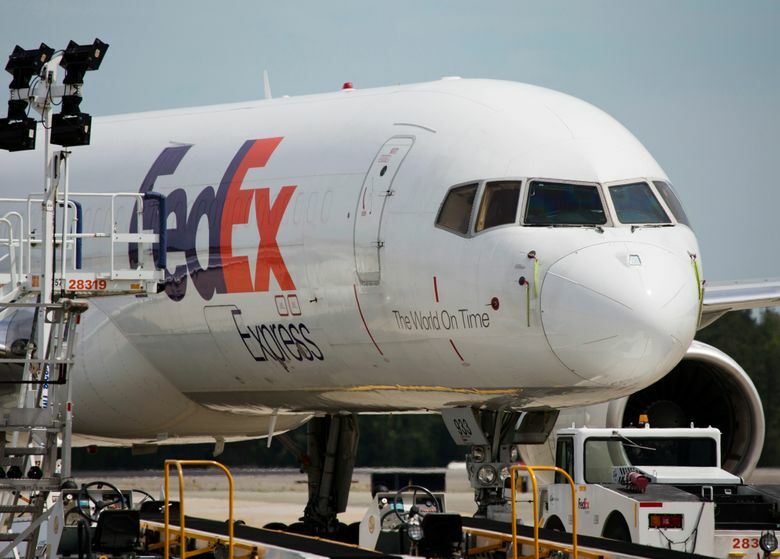 FedEx said that a rebound in global trade helped air cargo post its strongest growth since 2010. The company is clearly worried that source of growth could be cut short by a trade war. “FedEx is concerned about the prospect of increased protectionist tariffs as history has shown repeatedly that protectionism is counterproductive to economic growth,” Smith said. He did not mention by name President Donald Trump, who has imposed tariffs on steel, aluminum, solar panels and washing machines. Smith began the call by expressing thanks that no one was seriously injured when a package exploded Tuesday at a company facility in Texas. One employee suffered minor injuries. Authorities believe the blast was related to a series of recent bombings in the Austin, Texas, area. Memphis, Tennessee-based FedEx reported that revenue rose 10 percent to $16.53 billion, beating an average forecast of $16.18 from the analysts surveyed by Zacks. Operating income rose 23 percent in the ground-shipping business but fell 24 percent in Express, the overnight delivery of letters and parcels. FedEx spent more on fuel, labor and extra transportation during the peak season than it did a year ago. The company raised its forecast of full-year earnings to between $15 and $15.40 per share excluding items related to tax benefits, pensions, and the cost of integrating TNT, which it bought in 2016. That’s up from a previous forecast of a range between $12.70 and $13.30 a share. FedEx enjoyed record traffic between Thanksgiving and Christmas because of the increase in delivering for online shoppers. Rival United Parcel Service Inc. added surcharges to many deliveries during the peak season, but FedEx took a more targeted approach and avoided additional fees for most holiday deliveries. FedEx executives said their approach won over small and medium-size customers. The company also announced Tuesday that it will add 500 FedEx Office locations inside Walmart stores over the next two years. Before the results, FedEx shares closed up $2.38 at $251.99. In late trading the shares initially rose but then slipped by $3.79 to $248.20. At market closing, they had gained 31 percent in the last 12 months.